This year I was able to be in Quito on February 2, the Feast Day of Our Lady of Good Success. I had never been in that colorful and beautiful city before. I arrived on February 1st and left on the 7th. From February 1st to the 3rd, when the Statue returned to her cloistered place in the Convent’s upper choir, I tried to stay with her as much as I could, which translates into about four or five hours every day. Although photos with flash were not allowed in the Church and my camera is not a professional one, I took many pictures on those days, some of which I will share with my readers. Upon entering the Church of the Immaculate Conception, which is majestic and very dignified – but not as rich as the Cathedral or the Church of San Francisco – one needs some time to adapt his spirit to that baroque atmosphere of old Quito. While this adaptation takes place, the eyes are drawn to the main Statue on the central altar, which replaces Christ Crucified during those days. There was the Statue of Our Lady of Good Success. She reigns from her niche not only as the Abbess of the Convent of the Immaculate Conception but as the Empress of the world. The way she holds her staff gives the impression that she is ready to take some steps and descend in order to exert her dominion over all her subjects. I don’t know of any picture of Louis XIV in all his pomp that has more majesty than Our Lady in that Statue. She has something of the rejected majesty that can be seen in the Holy Shroud of Turin. God Incarnate was rejected, condemned for the good He did and crucified between thieves. His Sacred Face is the paradigm of majesty rejected: it is the Divine Majesty rejected. In my opinion, Our Lady of Good Success’ Statue revealed something similar on those days that she descended from her Abbess’ chair in the upper choir to be with the people of Quito. The expression of the Sacred Statue did not soften during the two next days. On the afternoon of February 3, she was brought from the central altar to a place on an andor near the Communion rail, as an intermediary site before she would return to the cloister. It was good for the faithful present who could see her more closely. But, viewing the sacred image closer, it seemed to me her sadness was still more pungent. She appeared to be on the verge of weeping, as the photos show. Now, why was the Statue so sad? Are there reasons for this apogee of grievance? I believe there are many reasons for that sadness. I list just a few. The New Mass is said for the nuns by two Franciscan priests. On February 3, one of these priests was denounced by the parents of two girls, then arrested and jailed for sexually abusing their daughters. This news was in the headlines of the local newspapers and the topic was still making front page news on February 6. The Archbishop of Quito, Fausto Trávez Trávez forbade the group of good Catholic men who for two decades have been bringing the Statue from the choir to the Church from carrying out this work. He also prohibited them to organize the Procession of the Dawn, a solemn procession carrying a smaller statue of Our Lady through the streets of the city in the dawn hours of her feast day, February 2. He passed these charges to the priests of the Society of Saint Pius X (SSPX), who overnight entered the picture and took over. The reason for this sudden complacence of the Archbishop with a group that says the Latin Mass, which he forbids in his whole Archdiocese, seem to be some rare exchange of favors on both parts. Indeed, the common talk in Quito was that the Archbishop had been pressured by creditors to pay the huge debt he had assumed during Pope Francis’ visit to Quito in 2015 and was unable to pay. It was being said everywhere that the SSPX advanced the needed amount of money in exchange for the Prelate’s pledge to replace that group of good Catholics who traditionally oversaw the descent of the Statue and organized the Procession of the Dawn. I also heard from well-informed persons that, when the SSPX priests tried to lift the Statue from the choir to bring her down to the Church, the Statue became so heavy that they were unable to do so. By the way, it is known that this is a common way for the Statue to show her displeasure: the Statue becomes so heavy that it cannot be transported even by a group of strong men. According to these trustworthy sources, the situation was so embarrassing that the nuns did not know what to do. The Archbishop was called and he decided that the Franciscans should carry it down. The Statue allowed herself to be transported by the Franciscans, but they could not move the Child Jesus, who in turn became insurmountably heavy. So, for that first night the Statue remained in the Church without the Christ Child in her arm. The next morning the Mother Superior could easily pick up the Child and place Him in the arm of His Mother. Here, I offer my readers some reasons – real or hypothetical, since I cannot guarantee the veracity of the rumors that were flying in Quito all while I was there – that may explain why Our Lady was so sad. In any circumstance, good Catholics need to make reparation for these and many other offenses being made daily against her and her Son. To call for reparation is the motif that inspired me to write these lines. Note from the Editor: Miss Salwa Bachar is in charge of TIA social media. What follows is a report I asked her to write after an irrational attack she suffered from the editor of the blog Vox Catholica, who I am not sure is a priest or not. After her reply, he found it more prudent to not answer her and made his comment and her reply invisible. A.S.G. “This article is Slanderous, and frankly whoever wrote it is in grave sin. The author falsely accuses the Archbishop of simony (accepting bribes for religious privileges etc. ), it totally mischaracterizes the TFP (Tradition Family Property, who has been illegally forcing themselves on the sisters of the convent), and it states that the SSPX moved the statue from the upper choir and that is also a DIRTY LIE. I have video footage of the Franciscan Friars 1) Leading the procession, 2) Carrying our lady down from the upper choir and placing her on the altar, 3) I have video footage of the Archbishop attending the dawn procession on Feb. 2, which is the first time EVER that he has participated in this devotion 4) and the idea that the Society has enough money to go around the world bribing bishops for privileges is a sick lie. How dare you accuse a good bishop of sin! How dare you spread this dirty propaganda from the NON-CATHOLIC SECT known as the TFP. “If you are so courageous, why don’t you present your grievances to the author of that article? I believe he stands behind what he affirmed. I am a lady who just advised your viewers to see the other side of the picture. “The unruly fury you showed against me for just suggesting another point of view shows that you believe you are infallible and you punish violently with words and physical threats those who are not on your side. This behavior is what scholars say characterizes the belonging to a sect. The exposition of the truth is normally calm and rational, not what you did, resorting to baseless personal attacks and labels. To date, Vox Catholica has not responded. I have read your article on the “Sadness of Our Lady in Quito – 2019.” Having been there myself for the lowering, I can tell you that the SSPX priests did NOT bring down the statue but it was the Franciscans. Perhaps some of the video and pictures I took of the event will be helpful to expose your lie. Accusing the archbishop of simony and accepting a large donation of money based on the “talk of the town” is a calumny and a grave sin. If you have the proof, offer the evidence. If you don’t, retract your lie immediately. What kind of a Catholic man throws baseless and unproven accusations against a prelate of the Church? You talk of Catholic “knighthood” and “honor.” Such is not in the example of Catholic honor and chivalry that your mentor, Dr. Plinio taught you, I am sure, and that TFP so self-righteously claims to uphold. It is the tactic of Freemasons and all those who justify the means by the end. It is the tactic of all those in history who disregard morality, all those who serve as agents of the prince of lies. I can think of no other reason to publish such lies except that getting control of a convent of sisters and control of Our Lady is more important for you or for whoever you work for than honoring Our Lady’s requests and obedience to the hierarchy of the Catholic Church. If you have any decency and honor you will retract this article and publish a full apology immediately and may God have mercy on you if you do not. It will be my great pleasure to answer your rabid diatribe when I find some spare time. Unfortunately for me, I have to postpone this pleasure for about 20 days since I am busy with two other ongoing projects. To put some weeks between your message and my answer can give you time to cool your fury and check with your superiors to be sure that your points reflect well their position. It also will allow other like-minded protesters to come forth, so that I may answer all the objections together. I like many aspects of bullfights and I am glad you assumed the role of the bull charging at the red cape in the ring. THE ‘GOOD’ ARCHBISHOP TRAVEZ – After writing an article on the Sadness of the Statute Our Lady of Good Success, describing her visage as I encountered it in Quito, I was furiously attacked by two SSPX representatives. One is the anonymous editor of Vox Catholica, who I suspect is a priest, and the other is Fr. B. Haenny. I gave a brief answer to the latter, postponing my reply. It will start now. The “courageous” anonymous Vox Catholica editor attacked me indirectly in a brutal and disgusting physical threat against Miss Salwa Bachar, who is in charge of the TIA social media and had recommended my article to the readers of that media outlet. Both attacks revealed a total lack of self-control, which made me wonder if that arrogant intemperance is something common among SSPX priests. I dispense myself from refuting each of those accusations, because a very competent reader, who I do not have the pleasure to know personally, spontaneously defended Miss Bachar and me, putting their false indictments to rest. His answers can be read here. In this article I will expose some background data that may help my reader to understand better what is behind those accusations, the SSPX presence in Quito and more particularly in the Convent of the Immaculate Conception of the contemplative nuns. Both attacks against me have a suspicious twist. I wrote that it was common talk in Quito that the SSPX had paid the debt incurred by Arch. Fausto Travez during Francis' visit in 2015. My aggressors instead of simply saying: “No, SSPX did not pass any money to Travez,” tried to divert the attention of their followers by pretending that to accuse Travez of receiving money would be absurd. That Prelate would be so good and so far above any suspicion that I would be committing a mortal sin by even suggesting that the Quito common talk could be true. It is surprising that I have to prove to traditionalists that a progressivist Prelate can not be a saint… But since it is necessary, let me do so. When I mentioned that two girls had been sexually abused by a priest on February 3, I was mistaken. The abuse that triggered the scandal took place on February 2, the same day of the feast of Our Lady of Good Success. This lends more gravity to the fact that the Franciscan priest who committed the abuse was one of the two who say Masses for the nuns. However, there is more. That priest was Fr. Nestor Genaro Bustos, know in Quito only as Fray Bustos. He is a trusted friend of Arch. Travez and is constantly at his Palace, a well-informed university professor told me. Confirming this is the fact that Fr. Bustos was one of the few persons chosen by Travez to offer public Masses for the Feast day of Our Lady of Good Success at the Church of the Immaculate Conception. I was actually present at the church when a man very similar to the one who appears in the photos at right started a Mass at 9:30 a.m. I left the church and returned at 11:30 a.m. and he was still at the altar saying a New Mass with his stentorian voice. I am not sure if he said just one Mass or two. The other New Mass was said by a Bishop, who I believe, by comparing his photo with the Prelate I saw there, is the Auxiliary Bishop Rene Coba. Fr. 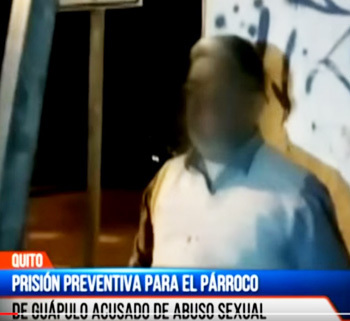 Bustos left that Mass and went to his parish in Guápulo where he abused a 14-year-old girl by touching her intimate parts and asking her to kiss him; before he tried to lure her with some candy. The parents of the girl were informed and learned that their other daughter, age 10, had also been abused by Bustos. The Franciscan Province condemned the abuse committed by Frey Bustos and promised to collaborate with the civil authorities. The “good” Archbishop Travez, who is also a Franciscan, kept silent. The dramatic blow of this scandal on the same day of Our Lady’s Feast of the Purification, perpetrated by the same priest that said her Mass at the Convent of the Immaculate Conception, seems symbolic to show us how rotten the whole situation of the clergy in Quito is. A highly placed diplomat spontaneously told me that it is known everywhere in Quito that the Franciscan Monastery is infected with homosexuals. The “good” Travez, however, enlisted those same Franciscans to replace the Ecuadorian lay Catholics who for decades had been helping to transport the Statue of Our Lady from the Convent's upper choir to the church twice a year. 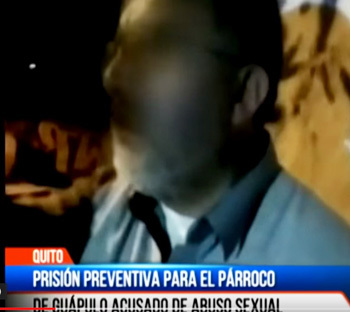 There have been other cases of pedophilia in Ecuador, but it is not rare for the judicial suits to be dismissed by the civil authorities. Very well-informed sources told me that there is an agreement between the Catholic Hierarchy and the government: the recent communist governments – of Rafael Correa and, now, of Lenin Moreno – allegedly have a dossier with a large number of clerical scandals of pedophilia and homosexuality ready to be released. But, according to these sources, they made a deal with the Catholic Hierarchy to hold it back so long as the Bishops and clergy do not attack the communist agenda of the government. And, in fact, the Hierarchy is not attacking it. This would be the reason why there are relatively few cases of clerical pedophilia and homosexuality reported and why the few that are disclosed are often dismissed. Regarding a possible agreement between the Hierarchy and the government in Ecuador, the principle applies that when a hypothesis explains everything in a way that otherwise cannot be explained, it constitutes a strong circumstantial evidence in favor of its veracity. With these data in mind, I believe that it is absolutely licit and even normal in political calculations – applying the same Socratic method (1) – to speculate that SSPX helped the progressivist archbishop to pay his debts in order to have access to the Convent of the Immaculate Conception. Nothing seems more probable, given that SSPX had no noticeable presence in Quito and its main characteristic – to say the Traditional Latin Mass – had been forbidden in the Quito Archdiocese for a long time. 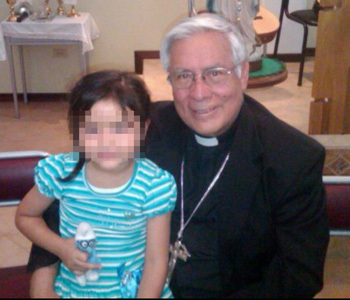 As we see, the strong suspicions about Archbishop Travez’ morality do not provide any guarantee of virtuous behavior. On the contrary, they induce any impartial observer to raise the possibility I raised. Unfortunately, I am running out of space. I still need to address other points regarding the presence of SSPX in Quito. One of them is the agent it infiltrated into the Convent in order to poison the nuns and expel those good Catholics who used to provide assistance for the Feast day ceremonies. I plan to address this matter shortly. The art of discovering the truth by means of raising hypotheses, a respected method attributed to Socrates. I just saw this today. Has anyone heard of any statements from SSPX or Vox?